Cover the pot and secure the lid. Make sure valve is set to “sealing.” Set the manual/pressure cook button to 3 minutes. When the timer is up perform a quick release by moving the valve to venting. Remove the lid when you can. Gently stir the contents of the pot. Scoop onto serving plates or bowls and enjoy. I don’t like cajun seasoning. If you’re not a fan of cajun seasoning your could use kielbasa sausage instead of andouille and use a different seasoning like montreal chicken seasoning or lemon pepper seasoning. Where did you find your sausage? There are all sorts of types of sausage. For example chicken sausage with apples or kielbasa sausage. They look like plump hot dogs and come in a 12 ounce package. Really you could use any kind of sausage that you want. I chose an andouille cajun style sausage. I found mine in the grocery store by the bacon and other cured meats. Can I use canned green beans? No. Don’t do it! 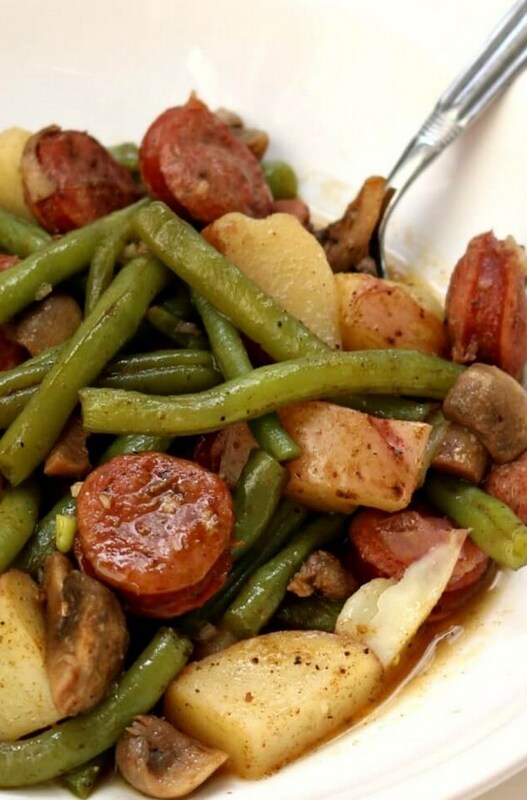 Fresh green beans taste so great in this meal so use fresh. Plus canned green beans would get really mushy. I don’t like mushrooms. It’s fine. You don’t have to add mushrooms in. You can definitely leave them out. Can I use another type of potato besides red potatoes? You can. Yellow potatoes will cook at the same rate as red potatoes. Russet potatoes will take a bit longer and I would peel the russet potatoes if I were you. Add 1-2 minutes to the cooking time for russet potatoes.